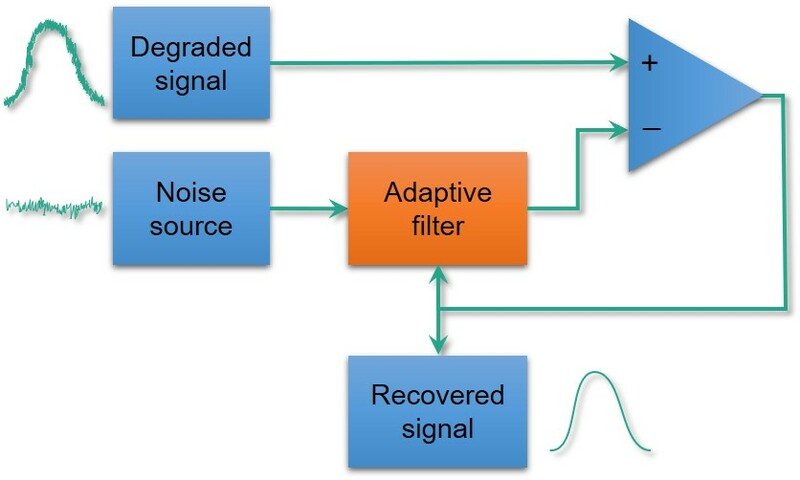 The adaptive filter (AF) differs from the traditional FIR or IIR filter since, as its name suggests, it adapts to the input signals (it has more than one), and learns to distinguish between noise and the wanted input. There are many instances in which such a capability is useful. 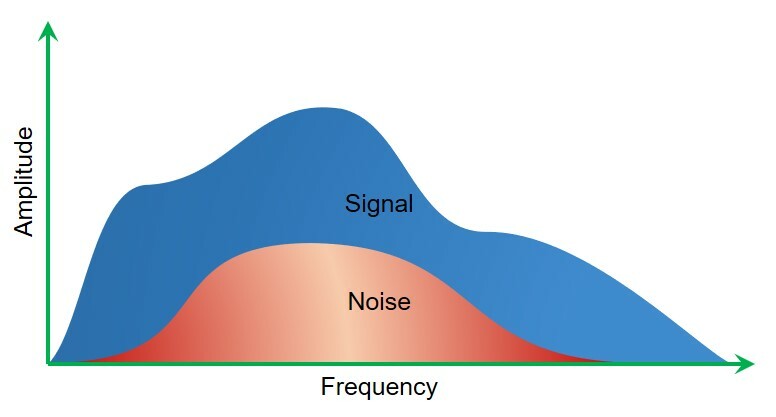 For example, a broadband source, such as a speech or music signal, might be degraded by noise with a similar broad bandwidth, such as engine noise. A fixed frequency response filter could not be used, since in removing the noise it would clearly also remove the signal. Another case could be a speech signal degraded by a non-stationary narrowband signal such as a tone or whistle that rises and falls in frequency within the signal bandwidth. A fixed frequency notch filter would be useless since the noise would move beyond the stop zone of the filter’s response. Signal Wizard 2.5 has a true dual input adaptive filter function. It uses two inputs, the degraded signal and the noise reference. As an example, think about a helicopter pilot communicating with air traffic control, using a microphone mounted within the helmet. Helicopter cockpits are noisy places, so inevitably the microphone will pick up not just the pilot’s voice, but also noise from the engine and the rotor blades. One input for the AF is connected to the pilot’s microphone (degraded signal). The second input is connected to a microphone outside of the helmet, listening to the engine/rotor noise (noise reference). No frequency response needs to be specified; the user only needs to set the learning rate and the number of coefficients. However, since these are already pre-optimized by the software, in practice very little adjustment is necessary. Case study: Real time broadband noise cancellation from audio. A music recording is severely contaminated with broadband (white) noise. This noise encroaches upon the entire spectrum of the music, and is therefore very intrusive. The degraded audio is fed live to the adaptive filter in Signal Wizard, along with the noise source. The algorithm adapts to cancel the noise, and within a few seconds the recovered audio is plainly audible, yielding a very high-quality signal.